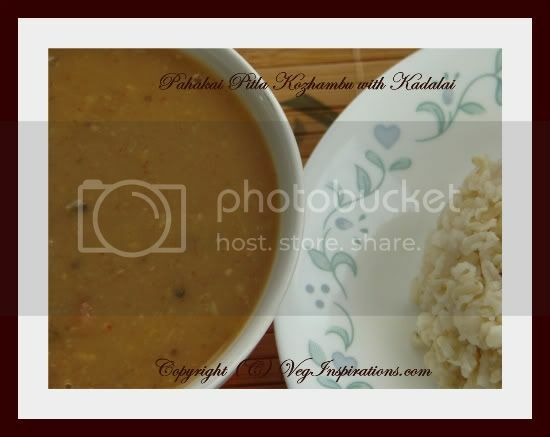 Pahakai pitla kozhambu or bittergourd in lentil gravy curry is a traditional curry type preparation originating from south Indian cuisine. I posted one recipe of this kozhambu along with a more detailed introduction to the dish here. Sometime back when I was on the phone with my mother in law she mentioned that her sister made her this new variation of pitla with peanuts in it that she really liked. Just the mention of peanuts was enough for me and I was completely sold on the idea. I could almost imagine the taste of the soft and juicy peanuts in lentil gravy even before I made it. Needless to say that this variation appeared in my kitchen very quickly after that conversation. The taste of this pitla was just as I imagined, delicious and the peanuts added a very unique texture and crunch to the kozhambu. Before I go on to the recipe here is a small tip on storing bittergourd that I discovered recently, some of you may already be knowing this.....In case you end up buying a lot of bittergourd that you are not able to use up immediately, cut lengthwise, remove the seeds and slice the bittergourd into 1/4 inch pieces. Place these pieces in a freezer safe plastic bag and place the bag in a freezer, the bittergourd stays for a good long while this way. small lime sized tamarind soaked in sufficient water to submerge it. 4 to 5 dry red chillies (or according to taste) to be dry roasted until it turns darkish. In case you do not use the pressure cooker to cook lentils, then cook raw peanut on a stove top adding water as required until it is soft yet firm. Heat oil in a heavy bottomed pan, add mustard seeds to it, when mustard seeds start to splutter add asafoetida powder, give it a stir. Then quickly add tamarind juice, cut pieces of bittergourd and salt to taste and allow to cook until the raw smell of tamarind disappears. The copyright of this content belongs to Veginspirations.comAdd cooked peanuts and allow it to simmer in this tamarind juice for a few minutes. Mash the cooked lentils and add to the tamarind juice. Add spice paste to the tamarind juice too. Add jaggery to this mixture and allow this mixture to simmer for a few minutes for the flavors to blend. Serve hot on a bed of plain steamed rice with chips/ papad/ vadam on the side. While grinding the spice mixture, first cool all the dry roasted lentil and red chilies to room temperature, then place in spice grinder and grind the dry ingredients first until they are powdered fine. Then add grated coconut, grind once, then add water as required and grind again until it forms a smooth paste. I came across this hilarious piece of humor that I have posted here , check it out if you have a minute.